The chart shows the average winter heat losses in a typically poorly insulated home. This can help guide investments from a thermal efficiency perspective. Start with items that are lower cost and provide a faster return-on-investment. At HEG™, we have developed a tried and tested “journey” or pathway for thermal efficiency. We assist you to prioritise the most cost-effective thermal efficiency investments that also have the greatest impact on comfort levels and health. All too often we see people investing in double glazing, solar power and home batteries first, whilst at the same time having a poorly-insulated home, unserviced air conditioners and no air circulation system. 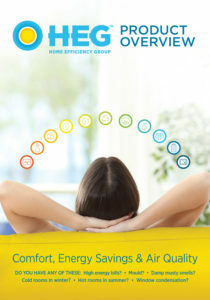 The HEG™ Thermal Efficiency Investment Guide provides you with recommendations no matter where you are on your thermal efficiency journey. Heat Pump SOSA Heat Pump SOS (System Optimisation Service) is a thorough clean, performance test and inspection of your heat pump on both inside and outside units. LED LightingNot only are LED lights a lot cheaper to run, saving you up to 80% energy, they are also more eco friendly, reduce fire risks and last a lot longer. 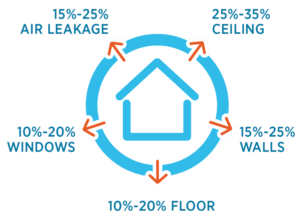 Ceiling + Underfloor InsulationInsulation is one of the most cost-effective investments to make. It keeps the cold out and greatly improves comfort levels. Condensation ControlImprove the air quality in your home with a HEG Air™ sytem and stop window condensation, mould and musty smells. Ducted Air Circulation + Roof Heat RecoveryControl the airflow throughout a house, and access free heat from a roof space with a Roof Heat Recovery Module. Heat PumpsHeat Pumps are one of the most popular form of heating because they can cool and heat. They cost about 30% to run compared to most radiant electric heaters. Heat Pump Hot WaterIt uses only 1kW of energy to generate 4.5kW of heat; this is 80 percent less energy compared to traditional hot water systems, with innovative technology allowing up to 50% faster heat recovery. Solar EnergyUsing only Tier 1 solutions to harness the suns energy, we guide you through the solar PV activation and installation process, ensuring you get the right sized solar energy solution. Energy StorageThe future in solar solutions, either a Sonnen, Tesla or SolaX. Consider investing in an energy storage system as it will give you back the power you need when the sun is not shining. Double GlazingDouble or triple glazed doors and windows with uPVC frames that do not conduct heat like standard aluminium frames look good and provide an additional layer of thermal efficiency to your home. These later items have higher initial cost and are a more strategic long-term investment. Contact the friendly staff at HEG™ to see how we can help.